Super light-weight: No dependency, just a single file. Easy to learn. There're only 4 APIs you need to learn for building simple CLIs: cli.option cli.version cli.help cli.parse. Yet so powerful. Enable features like default command, git-like subcommands, validation for required arguments and options, variadic arguments, dot-nested options, automated help message generation and so on. Developer friendly. Written in TypeScript. A command's options are validated when the command is used. Any unknown options will be reported as an error. However, if an action-based command does not define an action, then the options are not validated. If you really want to use unknown options, use command.allowUnknownOptions. When using brackets in command name, angled brackets indicate required command arguments, while sqaure bracket indicate optional arguments. When using brackets in option name, angled brackets indicate that the option value is required, while sqaure bracket indicate that the value is optional. 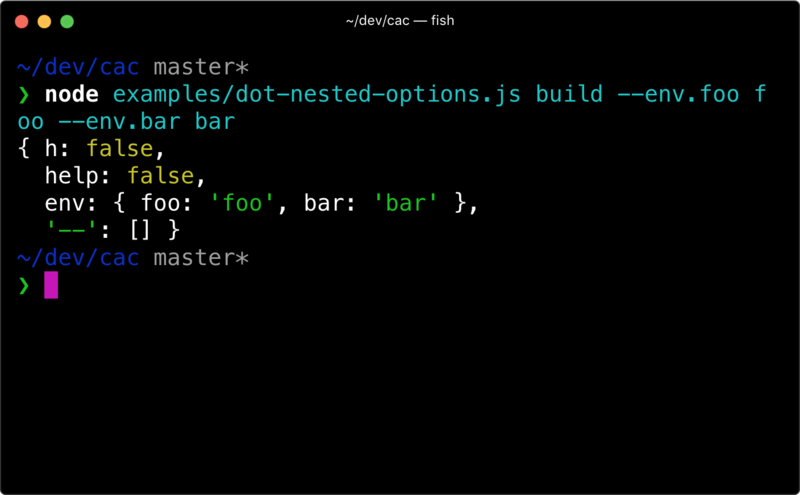 Dot-nested options will be merged into a single option. Register a command that will be used when no other command is matched. VuePress: 📝 Minimalistic Vue-powered static site generator. SAO: ⚔️ Futuristic scaffolding tool. DocPad: 🏹 Powerful Static Site Generator. Poi: ⚡️ Delightful web development. lass: 💁🏻 Scaffold a modern package boilerplate for Node.js. 💁 Check out the generated docs from source code if you want a more in-depth API references. config.allowUnknownOptions: boolean Allow unknown options in this command. config.ignoreOptionDefaultValue: boolean Don't use the options's default value in parsed options, only display them in help message. config.default: Default value for the option. config.coerce: (value: any) => newValue A function to process the option value. When this method is called, cli.rawArgs cli.args cli.options cli.matchedCommand will also be available. Output version number when -v, --version flag appears. Output help message when -h, --help flag appears. Output help message. 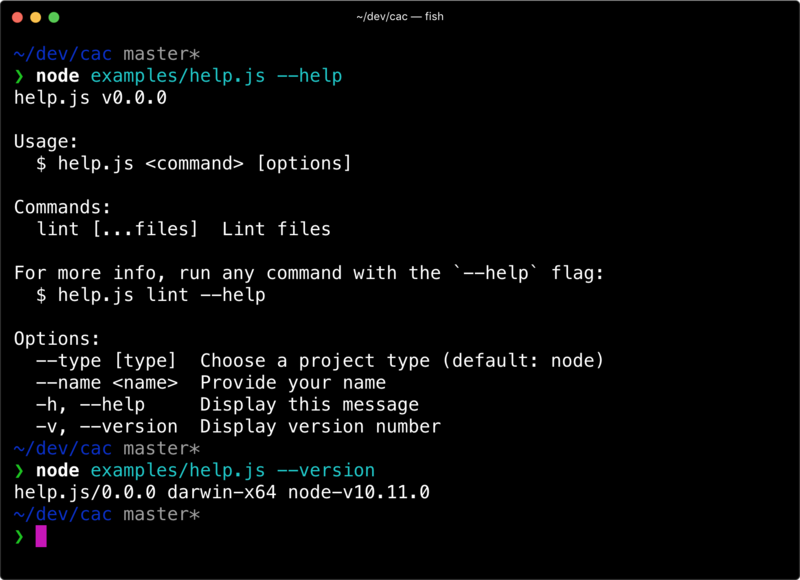 Optional subCommand argument if you want to output the help message for the matched sub-command instead of the global help message. 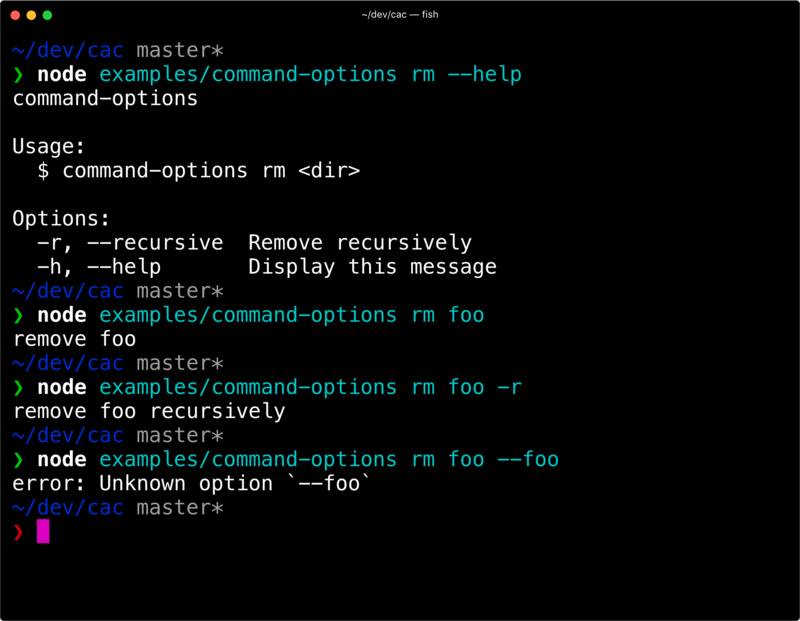 Basically the same as cli.option but this adds the option to specific command. Use a callback function as the command action when the command matches user inputs. Add an alias name to this command, the name here can't contain brackets. 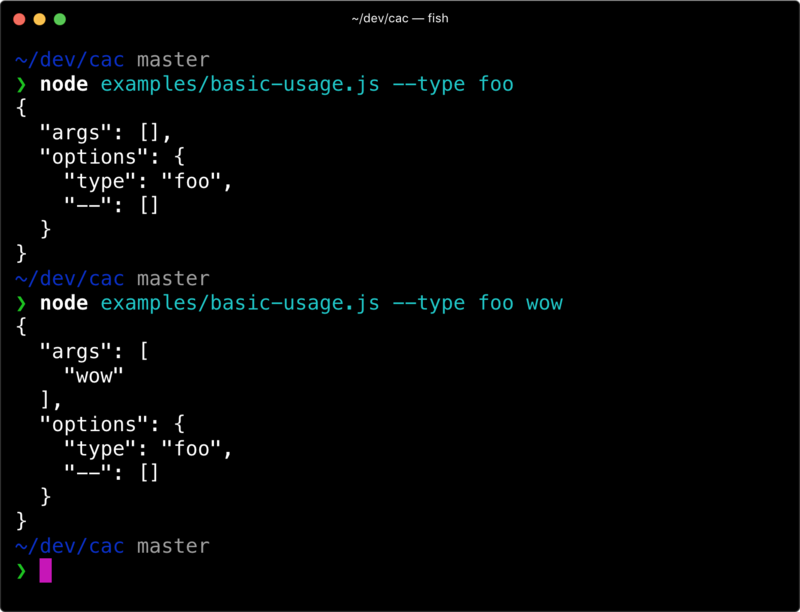 Allow unknown options in this command, by default CAC will log an error when unknown options are used. Add an example which will be displayed at the end of help message. 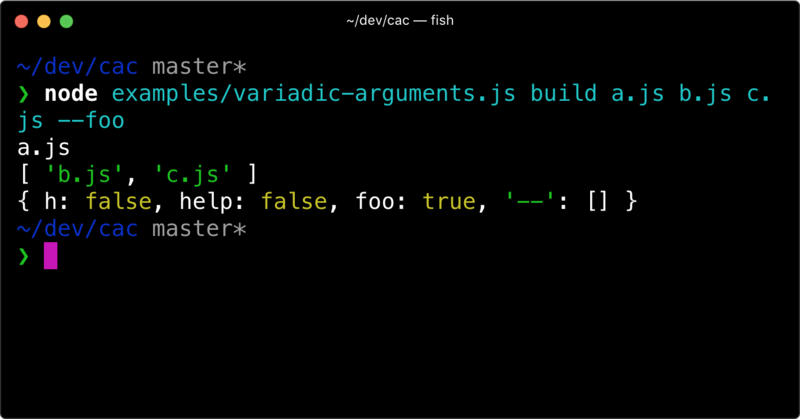 CAC, or cac, pronounced C-A-C.
CAC is very similar to Commander.js, while the latter does not support dot nested options, i.e. something like --env.API_SECRET foo. Besides, you can't use unknown options in Commander.js either. CAC © EGOIST, Released under the MIT License.